The second version of this song, perhaps a better version, more evolved into an instrumental piece. This song naturally has a very instrumental rhythm when I play it, so I chose it to demonstrate something of what the dulcimer would sound like as a solo instrument or playing lead, in this almost fluid classical style. This version is without the acoustic sound of the air mic and I would have used only this version if I hadn’t included the other for the comparison of recording technique and its effect on the sound. 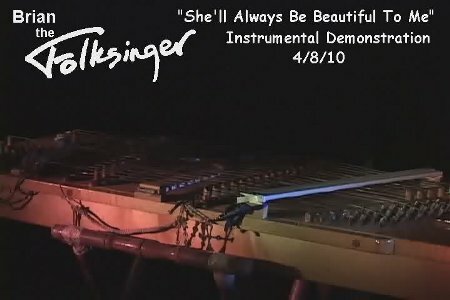 I also play instrumental leads that are more derived from the unique qulities of the dulcimer, with more percussive syncopation, trills and rolls, instead of simple melodic lines. You hear some of both in this rendition, a good example. Though as always, I can’t begin to show everything the dulcimer can do. This entry was posted on Wednesday, April 28th, 2010 at 5:12 am	and is filed under The Electric Hammered Dulcimer. You can follow any responses to this entry through the RSS 2.0 feed. Both comments and pings are currently closed.